Why do we garden? It's a reasonable question to ask and it seems that many have. Tongues have been wagging recently around the internet asking the same question, with many providing answers too. But gardening for a past time has slipped into a downward spiral, maybe a reflection of the current economy or maybe just a sign of the times. It appears that the message of why we garden maybe clouded that its lost its relevancy in this day and age. Oh you didn't just say that! 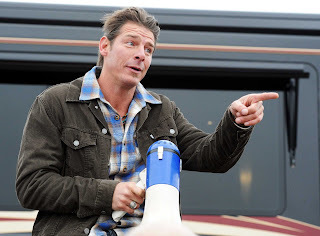 Just the other day I caught a commercial on TV for Ty Pennington's Home and Remodeling show at the local expo center. Home and Remodeling? It used to be called Home and Garden show! It appears that even Ty Pennington has turned his back on the whole gardening industry. I seem to remember some pretty good gardens being installed when the show was in its infancy, until they did away with a garden designer in favor of highly emotional interior designers. Seeing grown men cry makes better TV I'm sure! 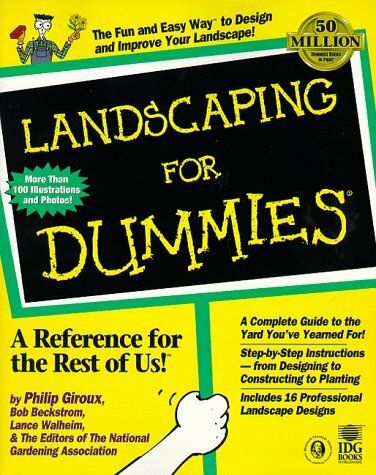 I know I'm ragging on Ty for something that probably out of his hands but, gardening doesn't carry the same glamour anymore as reflected in a trade publication, 'Grower Talks'. They recently published an article called 'Why doesn't she garden? ', highlighting a survey carried out by an industry giant, Ball Horticultural Company. The survey was to discover why the common gardening demographic, 'the white 40 or so female', has decided not to garden. This was backed up by numbers from the National Gardening Association, that produced data showing gardening had dropped from 41% to 29% in the past 6 years. Scary stuff. But who out there is promoting gardening anymore? Television has turned its back on us gardening folk as I've written about before in 'The other garden makeover' post. 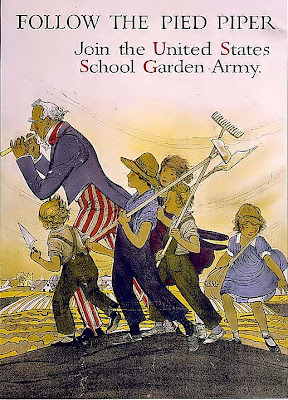 I was brought up in a society where parents and grandparents all gardened and passed the knowledge on. 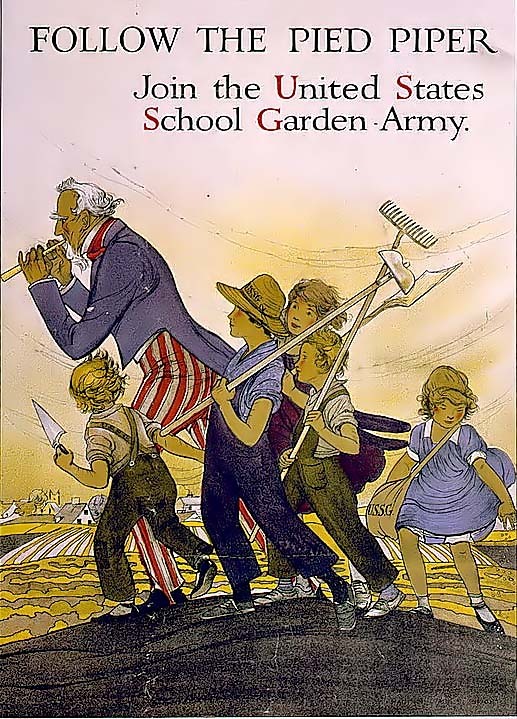 Schools had gardening clubs and every Friday night, 'Gardeners World' (for those in the UK) came on and exposed us to the joys of gardening. There was even an after school children's show called 'Blue Peter' that had the presenters working in the studio's garden under the direction of the head gardener. How does the younger generation these day get introduced into gardening when so many of the resources that we relied on have gone? Percy Thrower - Introduced many children to gardening and the joys of a good pipe! Of course the demographic is very restricted to just white females being the core customer. It fails to take into consideration males or any of the vast ethnic groups that live in this great land. Still this is a troubling trend that we in the industry need have to change. 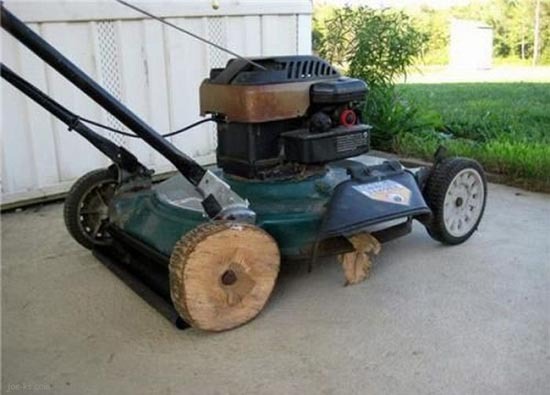 The big question is how do we change peoples perspective on gardening and encourage them back into their yards? Any thoughts? Write and leave your comments, maybe we can start a growing revolution! Have you ever met someone who runs a business and wondered how in the hell they ever managed to keep going? I've noticed for sometime now that there's quite a few people running their own landscaping companies that for the most part have no idea about what they're doing. I'm beginning to believe that the only credentials you need to start up a landscaping company is just to own a lawnmower and a pickup truck. My case in point is regarding a landscaper that I helped in finding some plant material. The 'Boss' was a tall, chunky fella, who had the winning world record breaking 'blank stare'. Like many, he was looking for some 'green trees' that were cheap. We headed over to a block of 3 gallon Leyland Cypress and he ask how big they grew. Not a bad question to ask, unless of course you claim to be a landscaper and run a tree and landscape company! Being in the business you should know how big a Leyland Cypress can get as its one of the questions a customer, who isn't in the business will ask. It blew me to see someone masquerading as a green professional, not knowing the first thing about 'green trees' (including what conifer meant) that he'd been hired to plant. 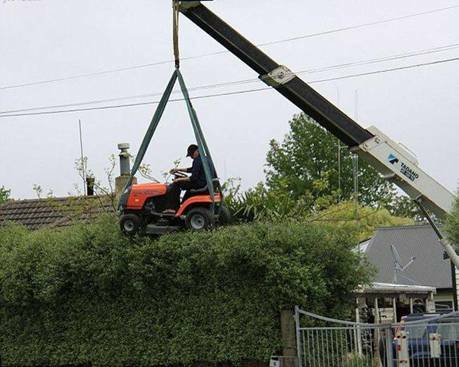 How did he ever get jobs, what credentials did he offer and how was he able to stay in the landscaping business knowing as little as he did? 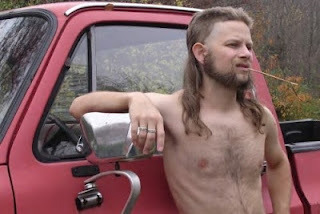 "Yeah, I'm a master groomer, I'll trim that bush for you"
Even his crew gave me the heeby geebies as I loaded up his pick-up. They all looked like the people you see in mugshot photos, featured in local newspapers, reviewing the convictions for the area. Maybe that's how they dealt with advertising? Nothing about them suggested gardening unless it was away to case someones house while mulching the beds! Sadly this isn't an isolated case. I once got a call from an owner of a tree company who wanted to know if the branches he was cutting off a cherry tree would root up if he pushed them into the ground. Of course taking cuttings of plant material is one way to propagate trees and shrubs, but these were 6 to 7 ft limbs! To think someone agreed to let this fella loose on their trees! Even sadder to think he was about to charge them for planting up some young trees he just happened to find. My other favorite is when these professionals don't know what pest or disease is affecting their customers plants. One landscaper asked if the bag worm cocoons on a conifer were leftover Christmas decorations! I know sometimes it's hard to diagnose problems, but bagworms and Christmas decorations are completely different. 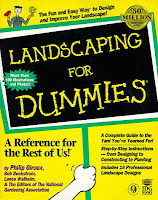 Of course it's not just landscapers but customers will ask stupid questions about what their landscaper is seen doing. One woman called our store with concerns over the health of her lawn. She had been watching the lawn maintenance company she hired, bag up and take away the grass clippings. She had worried herself silly that the grass was in someway contagious and needed to be removed like bio-hazard waste. My guess is that her Spanish wasn't that great to ask the question properly and the guys automatically answered yes to whatever she was asking. 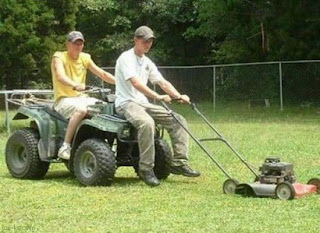 That being said, how many of these crews could tell you if you have a potential problem with your lawn or are they just trained to push a mower and move on to the next job. Which one do they call 'The Brains'? Still it all boils down to a simple phrase, 'you get what you pay for'. Many of these cheap landscape companies are only concerned with making enough money to fuel up the truck, pay for a pack of smokes and a case of beer to end their day. Its really no different than prostitutes, tell them what you need and they give you a price. Its no Julia Roberts from Pretty Woman, but instead a quickie so they can paid and move on before you know what hit you. If you're looking for lot clearance work, then these guys are good. However, if your needs are more detailed then you need to put up the bucks to get someone who knows a Leyland from a Lavender. I've told people that a good tree guy is worth his weight in gold. What does it say when he only charges for his weight in beer? Do you have any funny gardening stories? Write back and let us know! Its better to laugh than cry! If you enjoyed this you might also like these: Strangest Garden Center Questions & Growing Blunders. Around this time of year, a steady stream of people come to garden centers all reporting the same problem. Small annoying flies keep appearing around the base of their beloved house plants and no matter what they do, they can't seem to stop the swarm from appearing. Fear not, I'm here to help, for you my friend have 'FUNGUS GNATS'!!!!! In reality, this is actually a fairly common problem. However the thought of having small, mosquito like flies buzzing around your house isn't to appealing. Like any pest, these harmless looking flies can begin to effect your plant and could spread to others near by if left alone. A little work now to control the problem will prevent it from becoming out of hand later. Anyone who works with plants will be fairly familiar with fungus gnats already. Apart from houseplants, they can be a problem when trying to grow seedlings or root cuttings. However, the flies aren't the cause of issues. Instead, the culprit is the larval stage of the fly. They feed on the organic matter in the growing media as well as algae and fungus that is also growing in the same mix. These larvae can also cause damage by feeding also on the tender young roots of the plant growing in the container, and this damage provides opportunities for diseases to invade. 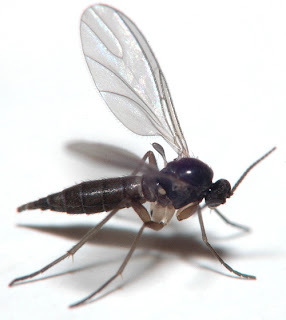 The actual flying adult gnats can be 'vectors' to transmit diseases from one plant to another, carrying spores of the pathogen as they travel around different plants looking for a place to lay eggs. Commonly, these disease can cause root rot, but some can also cause foliage damage. 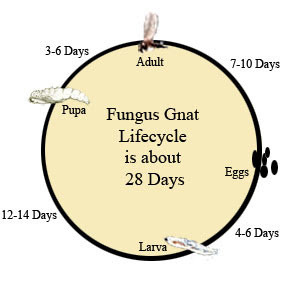 Fungus gnat larvae commonly live in the top 2 to 3 inches of the growing media around your plant. The larval stage grows rapidly, maturing in two to three weeks before transforming into the fly that you see. Fortunately, the adults are weak fliers and will only travel short distances in erratic patterns. In the case of house plants, they won't travel much past the vicinity of the plant they hatch out of, unless other plants are close by. Most adult flies will only live up to 10 days but during this period can lay up to 200 eggs into the growing media where they came from, allowing the population to boom. Firstly, house plants that have enjoyed growing outdoors for the summer months, more often than not have already been colonized by fungus gnats. 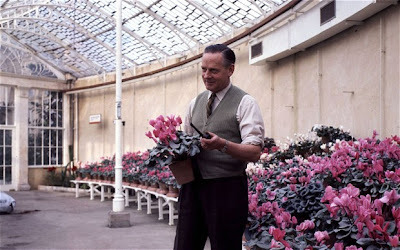 When the plants are brought into the home for the winter season, the population subsequently increases due to temperatures inside a home being optimal for continued reproduction. Secondly, fungus gnats are attracted to moist conditions to lay their eggs and for the larvae to develop. The reduction of day length during the winter season causes the plant to slow its growth rate and reduce its water consumption, leaving the growing media wetter for longer. Coupled with this, if the growing media is old it tends to break down or degrade, holding more moisture for longer. Lastly, we tend to notice an increase in fungus gnats only because the colder weather keeps us inside where we notice the problem more. The chances are high that the plant already had fungus gnats over the summer but we didn't notice it until we started to spend more time inside with the plant. Changing the way we take care of the plant will effect how the gnat can build up its population. Replacing the top half inch of compost with sterile coarse sand will prevent the adult flies from laying eggs in the soil. In addition, re-potting your plant yearly will reduce any broken down growing media that creates a food source and habitat for the larvae. Placing Yellow Sticky Insect Traps around the base of your plants is a effective way to monitor activity of fungus gnats and alert you to an potential problem. The traps are sheets of yellow plastic that attract the flies who then get stuck to an adhesive coating on the card. Though good for monitoring it also helps trap the adult population from returning to the plant to lay more eggs. Some websites and books also recommend placing wedges of potatoes around the base of the plant so that the larvae are attracted to it as a food source. You simply pick up the wedge from time to time to see if there is any larvae feeding on it, just remember to throw them out before they begin to rot! Trapping is a great, organic way to remove the adult population before they lay more eggs back into the growing media. Yellow sticky traps, as mentioned above work well, but shallow containers with either Apple Cider Vinegar or White Wine also do well. As the vinegar or wine ferment, the adults are drawn to the sweet smell and fall into the liquid and drown. An added bonus is that vinegar is a natural deodorizer and will rid the air of gnats and smells alike. As for the wine, gnats aren't fussy, so a cheap bottle is recommended unless you want to enjoy a glass yourself. Just make sure you use containers that can't be confused with some you might drink from. 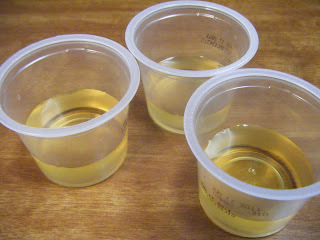 The Apple Cider Vinegar shots, works every time. However, if you're like me, using sticky traps may have draw backs if you have pets. Curious cats or inquisitive dogs often discover just how sticky the traps really are. Don't fret, nature has given us many organic controls that we can use to attack the enemy. Bacillus thuringiensis israelensis (BTI) is a naturally occurring bacteria successfully used in controlling Mosquitos , but has also proven very effective against fungus gnat larvae too. Safe to use and harmless to other living things, it's as simple as sprinkling it on the soil surface every couple of days and watering to dissolve it into the media. Gnatrol is the only BTI product labeled for use in controlling fungus gnats and several applications will be needed to control eggs and larvae, just follow the package for instructions. 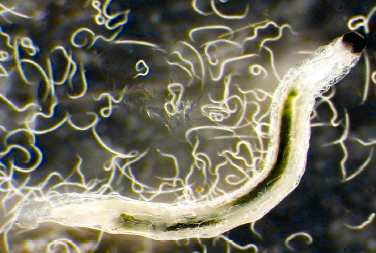 Another successful method is using beneficial nematodes, a predatory worm so small that you can't see it with the naked eye. 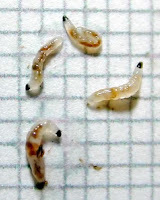 The most commonly used for fly larvae control is Steinernema feltiae that actually enter the larvae and release a bacterium, lethal to the larvae. Again, safe to use and harmless to other living things, they are just mixed with water and watered around the plant. Since both of these controls are living organisms it is unlikely to find them on the shelves of most garden suppliers unless at the beginning of the growing season. However, they are both available through mail order. Sometimes chemical control is deemed necessary and though caution is recommended there are products approved for use inside a home. The most effective are systemic insecticides that contain imidacloprid , available in granules and slow release spikes that also contain fertilizers. This will deal with the larval stage but not the adult flies. Several applications of pyrethroid based sprays should finish off what's left of your unwanted house guests. Many of these controls will also help deal with other creepy crawlies that may look at your house plants as a home. Always follow packaging recommendations as to how to handle and apply them safely and effectively. With a few simple steps you can rid your house plants of those annoying pesky flies and finally be able to invite company over for afternoon tea! If there was ever a plant you might refer too as a drag queen then the Blood twig dogwood, Cornus sanguinea would take the crown, or would it be tiara? Largely over looked through most of the year, this dogwood comes alive as any drag queen would, during its cabaret show that lasts all winter. 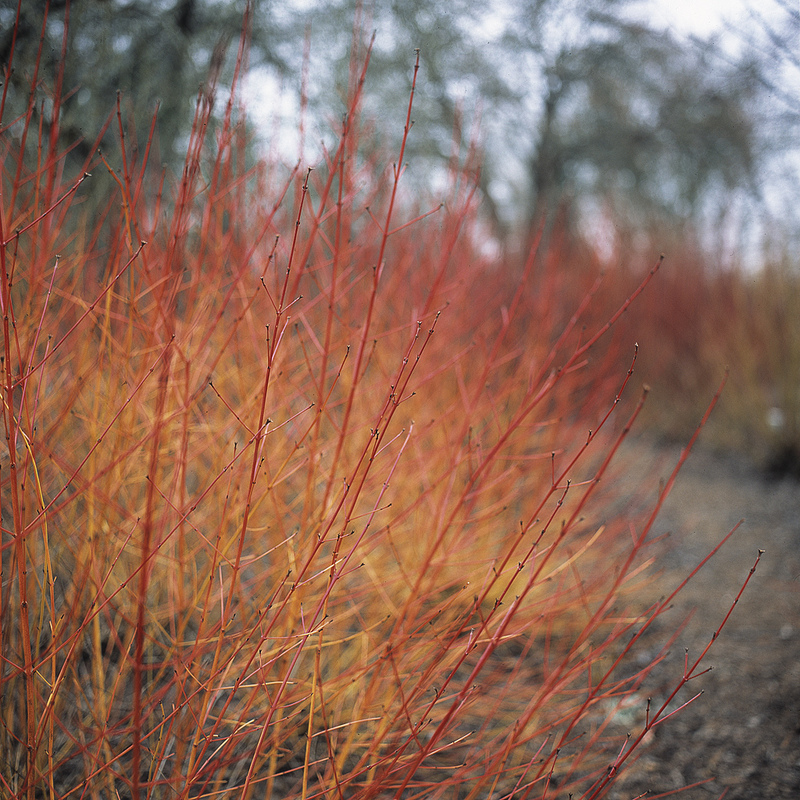 The name Blood twig gives it a ominous feeling but it refers to the rich color of its stems in winter. In fact, 'sanguinea' derives from the Latin meaning 'blood red'. The stems starts yellow at its base and gradually turns orange then crimson as it reaches the peak, giving it a feeling that the plants on fire. This color contrast provides the fix that so many of us crave during the dark dull days of winter. Found growing through much of Europe, from Britain to Scandinavia, down to Spain and east into Greece it has adapted well to live outside of its natural range. However, just like the Tartarian and Redosier dogwoods, the blood twig will too languish if grown in too hot of a zone. It will appreciate moisture, especially during periods of drought but once established is fairly tolerant of the occasional hardship. Only a few varieties exist on the market and most have found their way into garden centers and landscapes around the Washington DC area. However, in recent years a smaller variety come on the market opening more possibilities for its use. Up until then it was considered to large and spreading for the average garden. Below is a list of the most commonly seen varieties. 'Arctic Sun' is the newest member of the blood twig family. Hailing from a famed breeder of dogwoods, Andre van Nijnatten in the Netherlands. This dwarf form only reaches 3 to 4 ft, half of what they can normally reach. Breeding hasn't changed any of the characteristics that we have come to love, but the breakthrough in size means it has more appeal for use in the smaller garden. 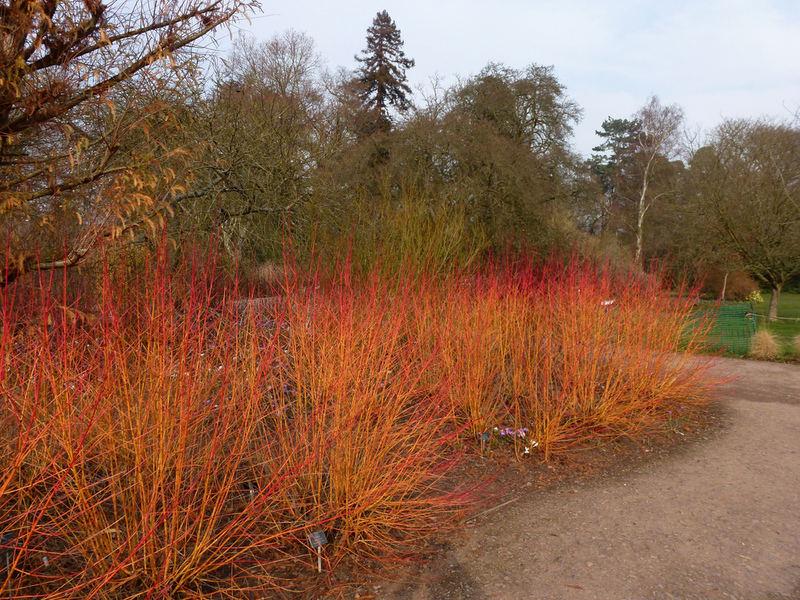 In fact, I have this planted in my garden and its appearance is unparalleled in the winter landscape. This coming spring I will need to whack it back in order for it to fill it out better, a job that will cause anguish I'm sure, but will definitely payoff for next winter. 'Midwinter Fire' has been the old standard since it was released. Originally discovered in a German garden in 1980, this selection showed an overall improved color than the species. It was only until the 1990's that it finally earned its name and made it into mainstream cultivation. Be warned, this variety can reach 8-10 ft, but with stooling, a process of cutting the stems down to the ground to induce new growth, in early spring before the new growth emerges, its height can be controlled. 'Winters Flame' is another dogwood to come from the same breeder as Arctic Sun, Andre van Nijnatten. This is the first year I managed to find someone with stock of this selection as prior to that the only variety that seemed to be available was 'Midwinter Fire'. 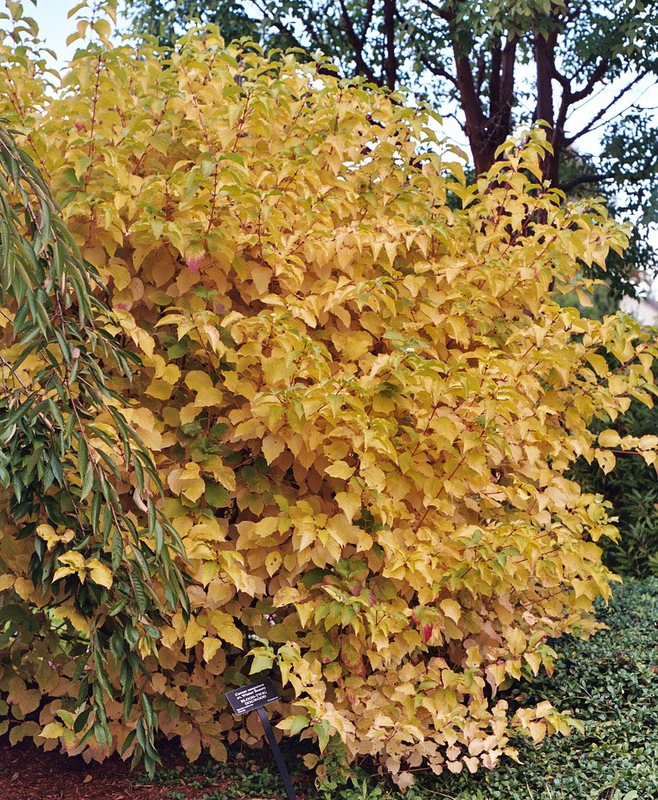 Though similar and even being noted by the woody plant guru, Michael Dirr to be the same, it is listed as compact, reaching a height of 4 to 6 ft. Spread can get wider but chopping the suckering growth with a spade will keep it in control. 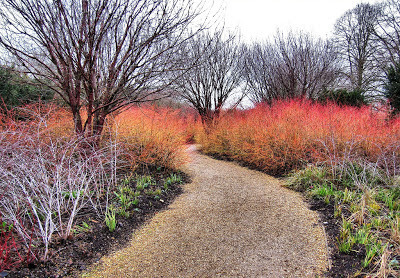 So on the cold dark days of winter why not warm your soul with the bonfire of color that these dogwoods provide. They may not sing volumes for most of the year but during that forgotten season of winter, it will step out on stage and shine like the sparkling sequin dress fit for any drag queen singing show tunes. Jumped into the conversation late? Check out Part One on Tatarian Dogwoods and Part Two on Red Osier Dogwoods. Feel free to comment and share your thoughts, I'd love to hear from you!